FIIs were net buyers of equity on all three trading days this week. Their total net buying was worth Rs 29.7 Billion. DIIs were net sellers of equity on Mon. and Tue. (Apr 8 and 9) but net buyers today. Their total net selling was worth Rs 8.5 Billion, as per provisional figures.Fall in auto sales, shortfall in direct tax collection and household savings, 7% contraction in FDI during Apr-Dec '18 are all pointing to a slow down in the Indian economy. According to the Federation of Indian Export Organisations (FIEO), rising protectionism, fluctuating commodity prices, inadequate availability of liquidity and slowdown in global trade will be major challenges faced by exporters.Note the following comment from last week's technical update on the daily bar chart pattern of Nifty: "The last ten trading sessions have formed a bearish 'rising wedge' pattern, from which a downward breakout can be expected. "As expected, a breakout below the 'wedge' occurred on T..
Gold chart patternThe daily bar chart pattern of Gold has formed a large 'cup and handle' continuation pattern. The pattern is more clearly visible on the 50 day EMA. An upward breakout can be expected after the 'handle' formation is complete.Note that a fall below 1260 - which is at the mid-point of the 'cup' - will negate the 'cup and handle' pattern. Gold's price is trading above its rising 200 day EMA in a bull market.Daily technical indicators are looking neutral to bearish. MACD is moving sideways below its signal line in bearish zone. RSI is facing resistance from its 50% level. Slow stochastic has emerged from its oversold zone.After a sharp rise above 97.70 on Mar 7, followed by a sharp fall to 95.20 on Mar 20, the US Dollar index recovered to 97.10 on Apr 2. It has been consolidating between 97 and 96.50 since then. Gold's price has been consolidating as well.On longer term weekly chart (not shown), gold’s price closed above its three weekly EMAs in long-term b..
WTI Crude Oil chartThe daily bar chart pattern of WTI Crude Oil has broken out above its 200 day EMA into bull territory. The possibility was mentioned in the previous post. The zone between 62 and 64 had acted as a support zone during Apr-Aug '18. It is likely to act as a resistance zone for a while.Daily technical indicators are looking bullish. MACD is trying to cross above its signal line in bullish zone. RSI is is poised to enter its overbought zone. Slow stochastic is inside its overbought zone. All three indicators are showing negative divergences by failing to rise higher with oil's price. Some consolidation or correction is possible before oil's price can overcome the resistance zone.On longer term weekly chart (not shown), oil's price closed above its three weekly EMAs in long-term bull territory after 5 months. Weekly technical indicators are looking bullish. MACD is rising above its signal line towards neutral zone. RSI is moving above its..
FIIs were net buyers of equity on all three trading days this week. Their total net buying was worth Rs 26.3 Billion. DIIs were net sellers of equity on Mon. & Tue. (Mar 25 & 26) but net buyers today. Their total net selling was worth Rs 0.74 Billion, as per provisional figures.According to ICRA, Indian basmati rice exports may touch an all-time high of Rs 300 Billion in FY 2018-19, on the back of strong demand from Iran and firming up of prices. The previous highest export figure was Rs 293 Billion in FY 2013-14.A consortium of Tata Group, GIC (Singapore's sovereign wealth fund) and SSG Capital Management will invest Rs 80 Billion to buy a stake in GMR Airports Ltd, which is a unit of GMR Infrastructure Ltd. GMR operates airports at Hyderabad, Delhi, Cebu (Philippines), and is building airports at Goa and Crete (Greece). Note the following comments from the previous technical update on the daily bar chart pattern of Nifty: "The index is just 400 ..
WTI Crude Oil chartNote the following comment from the previous post on the daily bar chart pattern of WTI Crude Oil: "Some consolidation is likely before oil's price can attempt to move higher. 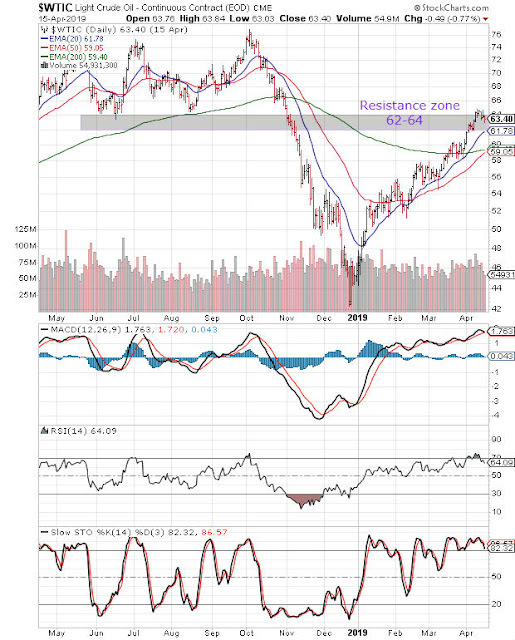 "Resistance from the 58 level was tested intra-day on Mar 1, but oil's price formed a 'reversal day' bar (higher high, lower close) that triggered a sideways consolidation with a slight downward bias.The 50 day EMA provided support. Oil's price closed above its 20 day and 50 day EMAs, but below its 200 day EMA in bear territory. Output cuts led by OPEC and good demand may enable oil's price to move above its 200 day EMA into bull territory. Daily technical indicators are in bullish zones but not showing much upward momentum. MACD is moving sideways below its signal line in bullish zone. RSI is treading water above its 50% level. Slow stochastic has fallen from its overbought zone. Some more consolidation is possible.On longer term weekly chart (not shown),..
FIIs were were net buyers of equity on the two trading days this week. Their total net buying was worth Rs 18.8 Billion. DIIs were net buyers of equity on Tue. (Mar 5), but net sellers today. Their total net selling was worth Rs 3 Billion, as per provisional figures.Nikkei India's Services Purchase Manger's Index (PMI) rose to 52.5 in Feb '19 from 52.2 in Jan '19. (A figure above 50 indicates growth.) The Composite PMI (Manufacturing + Services) rose to 53.8 in Feb '19 from 53.6 in Jan '19. According to data compiled by Centre for Monitoring Indian Economy (CMIE), the unemployment rate in India rose to 7.2% in Feb '19 from 5.9% in Feb '18. It was the highest unemployment rate since Sep '16.The daily bar chart pattern of Nifty shows that bulls came back re-energised after the long weekend. Bullish sentiments had already received a boost last Friday (Mar 1) when the shot-down Indian pilot was returned unharmed by our not-so-friendly neighbour.War hyster..
FIIs were net buyers of equity on all five trading days. Their total net buying was worth a huge Rs 76.4 Billion. DIIs were net buyers of equity on Wed. and Fri. (Feb 27 and Mar 1), but net sellers on the other three trading days. Their total net selling was worth an equally huge Rs 75.2 Billion, as per provisional figures.On Thu. Feb 28 (F&O expiry day), net selling by DIIs exceeded Rs 52 Billion, which turned them into net sellers (Rs 5.7 Billion) for the month. FII net buying during Feb '19 exceeded Rs 135 Billion, which was their highest net buying in a month since Mar '17. Despite heavy FII buying, Sensex (-1%) and Nifty (-0.3%) closed lower for the month.Nikkei India's Manufacturing Purchase Manager's Index (PMI) rose to a 14 month high of 54.3 in Feb '19 from 53.9 in Jan '19, due to increase in sales that fuelled growth of output and employment. (A figure above 50 indicates expansion. )Auto sales figures in Feb '19 were a mixed bag. Maruti (..
FIIs were net sellers of equity on all three trading days this week. Their total net selling was worth Rs 12.7 Billion. DIIs, who were also net sellers of equity on Mon. and Tue. (Feb 11 and 12), were net buyers today. Their total net buying was worth Rs 3.6 Billion, as per provisional figures.India's CPI-based retail inflation eased to a 19 months low of 2.05% in Jan '19 from a revised 2.11% in Dec '18, and was much lower than 5.07% in Jan '18. Negative food inflation was the main reason for the low inflation number.IIP (factory output) showed a 2.4% growth in Dec '18 from 0.3% in Nov '18. IIP was 8.4% in Oct '18. For the Apr-Dec '18 period, IIP growth was 4.6% over Apr-Dec '17.The following remark was made in last week's technical update on the daily bar chart pattern of Nifty: "A convincing close above 11090 - which is the Fibonacci 61.8% retracement level of the 1756 points correction from the Aug '18 top of 11760 to the Oct '18 low of 10004 - will put bull..
FIIs were net sellers of equity on Mon. (Feb 4) but net buyers on the other four trading days. Their total net buying was worth Rs 22.6 Billion. DIIs were net buyers of equity on Tue., Wed. and Thu. (Feb 5, 6 and 7) but net sellers on Mon. and Fri. Their total net selling was worth Rs 116 Million, as per provisional figures.Sluggish returns, market volatility and political uncertainty are affecting inflows into equity mutual funds in India. Inflows in Jan '19 dropped to Rs 61.6 Billion from Rs 66.1 Billion in Dec '18 and Rs 84.1 Billion in Nov '18.As many as 363 infrastructure projects, each worth Rs 1.5 Billion or more, have incurred cost over-runs of over Rs 3.42 Trillion due to delays in land acquisitions, forest clearance and supply of equipment. BSE Sensex index chart patternThe following comments were made in last week's post on the daily bar chart pattern of Sensex: "All four technical indicators are showing negative divergences by touchin..
S&P 500 index chart patternThe daily bar chart pattern of SPX 500 shows a dash for glory by bulls that got halted inside the Fibonacci resistance zone between 2640 and 2710 (which are the 50% and 61.8% retracement levels respectively of the correction from the Oct 3 top of 2940 to the Dec 26 low of 2347).In a 'V' shaped counter-trend rally from its Dec 26 low, the index had broken out above its 50 day EMA on Jan 17. For the next 6 trading sessions, it consolidated sideways - receiving good support from its 50 day EMA.On Thu. Jan 31, the index closed above its 200 day EMA in bull territory after 2 months, but bears were not yet ready to give up control. The index gained ~1.6% for the week, but failed to close above the resistance zone.Daily technical indicators are looking bullish and overbought. MACD is rising above its signal line in overbought zone. RSI is above its 50% level, but its upward momentum has weakened. Slow stochastic is rising inside its overbought zon..
WTI Crude Oil chartThe daily bar chart pattern of WTI Crude Oil manged to move above its 50 day EMA, but retreated after facing strong resistance from the 'support/resistance zone' between 53 and 55.Oil's price bounced up a bit after getting support from its 20 day EMA, but is trading well below its falling 200 day EMA in a bear market.Daily technical indicators are turning bearish. MACD is above its signal line in bullish zone, but may be forming a 'rounding top' reversal pattern. RSI is seeking support from its 50% level. Slow stochastic has corrected down from its overbought zone.US sanctions may curb oil exports from Venezuela, but with China's economy slowing down and ample global supply, a sustained rally in oil's price is unlikely.On longer term weekly chart (not shown), oil's price closed below its three weekly EMAs in long-term bear territory. Weekly technical indicators are in bearish zones and not showing much upward momentum. The 50 week EMA has just cro..
FIIs were net sellers of equity on all three trading days this week. Their total net selling was worth Rs 11.5 Billion. DIIs were net sellers on Tue. Jan 22, but net buyers on Mon. & Wed. (Jan 21 & 23). Their total net buying was worth Rs 10.2 Billion, as per provisional figures.In a bid to win a $20-billion Indian Air Force (IAF) order for 114 combat planes, Swedish manufacturer Saab has offered to build 96 Gripen fighter jets in India. The order seeks commitment from vendors about their willingness to supply sensitive technologies as well as carry out bulk of their manufacturing in India.According to D&B Economy Forecast, concerns about the government curtailing its investment due to significant shortfall in tax collections against the target, are expected to keep India's industrial activity subdued in the near term.The following remark appeared in last week's technical update on the daily bar chart pattern of Nifty: "A convincing index close abov..
FIIs were net buyers of equity on Tue. and Thu. (Jan 15 and 17) but net sellers on the other three trading days. Their total net buying was worth Rs 0.54 Billion. DIIs were net sellers of equity on Thu. and Fri., but net buyers during the first three days. Their total net buying was worth Rs 5.2 Billion, as per provisional figures.As per data available till Sep '18, the total debt of the Indian government has increased by more than 49% to Rs 82 Trillion during NDA's 4.5 year stint - from Rs 54.9 Trillion in Jun '14.Volatility in crude oil prices has hit synthetic textile manufacturers hard, with frequent change in buying behaviour observed for both raw material and finished product segments.BSE Sensex index chart patternIn last week's post on the daily bar chart pattern of Sensex, the following four possible outcomes of a breakout from the 'diamond' pattern was mentioned: a downward breakout, an upward breakout, a 'false' upward/do..
Gold chart patternThe following comments were made in the previous post on the daily bar chart pattern of Gold: "Expect gold's price to consolidate around current level for some time before it makes an attempt to cross above the next 'support/resistance zone' between 1260 & 1270. "The consolidation lasted barely three days. Gold's price dropped below 1250 intra-day during Dec 18-20 but received good support from its 200 day EMA. After easily crossing above the 'support/resistance zone' between 1260-1270, gold's price rose almost vertically - thanks to a falling US Dollar index - to touch an intra-day high of 1300 on Jan 4 '19.Formation of a 'reversal day' bar (higher high, lower close) with a surge in volumes have put a temporary halt to the rally. Some correction/consolidation can be expected after a hectic rally.Daily technical indicators are looking bullish and overbought. MACD is at the edge of its overbought zone. RSI has slipped down from its overbought zon..
FIIs were net sellers of equity during the three trading days this week. Their total net selling was worth Rs 10.0 Billion. DIIs were net buyers on Mon. & Tue. (Dec 31 & Jan 1) but net sellers on Wed. Their total net buying was worth Rs 2.4 Billion, as per provisional figures.YoY auto sales in Dec '18 were muted. Toyota, Bajaj Auto showed double-digit sales growth; Honda, Hyundai, M&M had low single-digit growth; Maruti, Tata Motors, Ashok Leyland, Isuzu, Royal Enfield showed negative growth.Nikkei India's Manufacturing PMI declined to 53.2 in Dec '18 from 54 in Nov '18, as growth in new orders and output moderated. (A figure >50 indicates expansion.) Job creation was the slowest in 4 months.The daily bar chart pattern of Nifty shows that bulls made a valiant attempt to sustain the counter-trend rally from the Oct 26 low of 10005. After touching a higher low of 10534.50 on Dec 26 and bouncing up from the lower Bollinger Band, the index ..
FIIs were net sellers of equity on Mon. (Dec 24) but net buyers on Wed. (Dec 26) after the X'mas break. Their total net selling was worth Rs 5.0 Billion. DIIs were net buyers on Mon. but net sellers on Wed. Their total net buying was worth Rs 0.5 Billion, as per provisional figures.India's low retail inflation is mainly due to food inflation falling to its lowest level since 2014. That directly relates to rural distress, because farmers are not getting adequately remunerated. No wonder they are angry, and voted against the ruling NDA in the recent state elections.The daily bar chart pattern of Nifty shows a smart pullback from the lower Bollinger Band today, after Monday's sharp fall below the three EMAs into bear territory.The index moved above its 200 day EMA and closed at its 50 day EMA - forming a 'reversal day' bar (lower low, higher close) - but stayed below its 20 day SMA (blue dotted line), which is the 'middle band' that sort of acts as the mid-po..
FIIs were net sellers of equity on Mon. & Thu. (Dec 17 & 20), but net buyers on the other three days of the week. Their total net buying was worth Rs 10.4 Billion. DIIs were net buyers of equity on Thu. (Dec 20), but net sellers on the other four days. Their total net selling was worth Rs 11.4 Billion, as per provisional figures.Equity mutual fund schemes registered a lower net inflow of Rs 84.14 Billion in Nov '18, compared to Rs 126.22 Billion in Oct '18 and Rs 111.72 Billion in Sep '18, mainly due to a volatile market. During the Apr-Nov '18 period, total inflow into equities have exceeded Rs 822 Billion. S. Naren, who manages Rs 3.1 Trillion as CIO of ICICI Pru AMC, says investors need to brace for a run of constrained returns that will last until the US Fed makes a policy U-turn. For 2019, Naren doesn't see investments in Indian equities fetching more than 'mid-teen' percentage gains. BSE Sensex index chart p..
S&P 500 index chart patternThe following remarks were made in last week's post on the daily bar chart pattern of S&P 500: "The strong index volatility during the past two months is an indication of a transition from a bull to a bear market...The impending 'death cross' of the 50 day EMA below the 200 day EMA will technically confirm a bear market. "What had appeared inevitable has happened - despite a valiant effort by bulls. The 'death cross' of the 50 day EMA below the 200 day EMA (marked by light grey ellipse) has technically confirmed that the index has fallen into a bear market.The index had dropped below the lower Bollinger Band to an intra-day low of 2583 on Mon. Dec 10 - only to bounce up and close 5 points higher than Friday's close, forming a 'reversal day' bar (lower low, higher close).That triggered a brief pullback rally. The index touched an intra-day high of 2685 on Wed. Dec 12, but again faced resistance from the falling 20 day SMA (blue dotted line). Bears tight..
FIIs were net buyers of equity on Mon. (Dec 3) but net sellers on Tue. & Wed. (Dec 4 & 5). Their total net selling was worth Rs 1.2 Billion. DIIs were net sellers on all three trading days this week. Their total net selling was worth Rs 21.2 Billion, as per provisional figures.Nikkei India's Manufacturing PMI rose to an 11 months high of 54.0 in Nov '18 from 53.1 in Oct '18. It was the 16th straight month of expansion (>50). Nikkei India's Services PMI also rose to 53.7 in Nov '18 from 52.2 in Oct '18. The Composite (Mfg. + Services) PMI rose to 54.5 in Nov '18 from 53.0 in Oct '18.RBI announced an expected status quo on interest rates at its policy meeting today, but kept its calibrated tightening stance intact. However, SLR will be gradually decreased from 19.5% to 18% @25 bps (0.25%) per quarter for the next 6 quarters to increase liquidity for lending in banks.The following comments appeared in last week's technical update on the daily bar c..
FIIs were net sellers of equity on Fri. (Nov 30), but net buyers on the first four days of the week. Their total net buying was worth Rs 23.3 Billion. DIIs were net sellers of equity on Wed. (Nov 28), but net buyers on the other four days. Their total net buying was worth Rs 25.2 Billion, as per provisional figures.For the month of Nov '18, FIIs were net buyers of equity worth Rs 49.3 Billion. DIIs were also net buyers of equity worth Rs 13.1 Billion. Both were net buyers in the same month for the first time since Mar '18. With FIIs and DIIs in buying mood, Sensex and Nifty rose to completely fill the downward 'gaps' formed on Oct 4. India's GDP growth slipped to a lower than expected 7.1% during Q2 (Jul-Sep '18) from 8.2% during Q1 (Apr-Jun '18) and 7.7% during Q4 (Oct-Dec '17). For the half year (Apr-Sep '18), GDP growth was 7.6%.Government's fiscal deficit during Apr-Oct '18 was Rs 6.48 Trillion, which was 103.9% of the full yea..
S&P 500 index chart patternIn a trading week shortened by Thanksgiving holiday, the daily bar chart pattern of S&P 500 conceded further ground to bears. The index lost more than 100 points (3.8%) on a weekly closing basis.Though the index closed well below its three EMAs in bear territory, technical confirmation of a bear market ('death cross' of the 50 day EMA below the 200 day EMA) is still awaited.Note that Friday's curtailed trading formed a 'gravestone doji' candlestick pattern, which can lead to a pullback towards the plummeting 20 day EMA. Daily technical indicators are looking bearish. MACD is falling below its signal line in bearish zone. RSI is sliding down below its 50% level. Slow stochastic has dropped inside its oversold zone, and is showing negative divergence by touching a lower bottom. Expect some consolidation before the bears strike again. On longer term weekly chart (not shown), the index closed below its 20 week and 50 wee..
WTI Crude Oil chartThe following remarks were made in the previous post on the daily bar chart pattern of WTI Crude Oil: "...oil's price has been consolidating within a bearish 'flag' pattern. Some more consolidation/correction is likely. "The consolidation within the 'flag' (shaded on chart) didn't last long. A downward breakout on Oct 30 led to a sharp correction and a close below the 60 level for the first time in 8 months.Daily technical indicators are looking bearish and oversold. MACD is falling below its signal line in oversold zone. RSI is well inside its oversold zone. Slow stochastic has remained inside its oversold zone for a month.The 20 day EMA has crossed below the 200 day EMA and is falling sharply. The 'death cross' of the 50 day EMA below the 200 day EMA seems imminent. That will technically confirm a bear market. Saudi Arabia has signalled a production cut from Dec '18. Expect a near-term floor to the plummeting price of oil.On longer term weekly chart (not shown)..
FIIs were net sellers of equity on all three trading days this week. Their total net selling was worth Rs 40.2 Billion. DIIs were net buyers on all three days. Their total net buying was worth Rs 50.5 Billion, as per provisional figures.Traditional bellwethers of rural consumption – two-wheeler and tractor sales – have moderated to 5% YoY in Q3 from 16-25% in Q2. Higher fuel prices are also starting to hurt urban demand – September witnessed a 3.6% YoY contraction in passenger vehicle sales. Core sector (coal, crude oil, natural gas, refinery, fertiliser, steel, cement, electricity) growth slowed down to a 4 months low of 4.3% in Sep '18 against 4.7% in Sep '17.The daily bar chart pattern of Nifty touched an intra-day low of 10005 on Fri. Oct 26 - its lowest level in 7 months - but all three technical indicators touched slightly higher lows. The positive divergences triggered a sharp counter-trend rally that is facing resistance from the fal..
FIIs intensified their net selling of equity shares during the week. Their total net selling was worth Rs 57.5 Billion. DIIs were net buyers of equity on all five trading days. Their total net buying was worth Rs 45.1 Billion, as per provisional figures.India's fiscal deficit touched 95.3% of full year budget estimate during Apr-Sep '18, compared with 91% during Apr-Sep '17. Spending touched 53.4% against 53.5% last year, but receipts were 39% against 40.6% of full year budget estimate last year.Liquidity position of India's financial markets have worsened with cash deficit widening to Rs 1.4 Trillion this week against a small surplus in the first week of Oct '18. RBI's efforts to improve the situation through bond purchases haven't helped much.BSE Sensex index chart patternThe following comment was made in last week's post on the daily bar chart pattern of Sensex: "A drop inside the Fibonacci support zone (between 33934 and 32372) is on the cards."Th.. S&P 500 index chart patternThe following comments were made about the daily bar chart pattern of S&P 500 in last week's post: "...it formed an 'inside day' as well as a 'hammer' candlestick pattern. Bulls appear to be ready for a fight back. "The index dropped below its 200 day EMA on Mon. Oct 15, but managed to close above the support zone between 2737 and 2689 (the significance of these levels were mentioned in last week's post). It bounced up to touch an intra-day high of 2817 on Wed. Oct 17, but formed a bearish 'hanging man' candlestick pattern.Bears used the opportunity to follow a 'sell on rise' strategy. The index dropped to seek support from its 200 day EMA, and closed flat for the week. (At the time of writing this post, the index is desperately trying to stay above its 200 day EMA - but for how much longer? )Daily technical indicators are looking quite bearish. MACD is falling deeper inside its oversold zone. RSI and Slow stochastic emerged fro..
WTI Crude Oil chartThe following remark was made in the previous post on the daily bar chart pattern of WTI Crude Oil: "Daily technical indicators are looking quite overbought, and can trigger a correction. "Oil's price rose to touch a 52 week high of 76.90 on Oct 3, but started correcting from the next day and dropped to seek support from its 50 day EMA. The subsequent pullback is facing resistance from its 20 day EMA.Daily technical indicators are showing downward momentum after correcting overbought conditions. MACD is falling below its signal line in bullish zone. RSI has slipped below its 50% level. Slow stochastic has dropped inside its oversold zone, and can trigger a rally.Oil's price is trading above its 50 day and 200 day EMAs in a bull market. Expect some consolidation before the starting the next leg of the rally.On longer term weekly chart (not shown), oil's price closed above its three weekly EMAs in long-term bull territory. Weekly technical indicators showed negativ..
WTI Crude Oil chartThe daily bar chart pattern of WTI Crude Oil received twin support from its 20 day and 50 day EMAs and rose to touch a 52 week high of 75.91 on Oct 2, but formed a small 'reversal day' bar (higher high, lower close).All three EMAs are rising, and oil's price is trading above them in a bull market. Trump's exhortation to OPEC to hike production and put a lid on oil's price appears to have fallen on deaf ears.Daily technical indicators are looking quite overbought, and can trigger a correction. Note the 'double bottom' reversal pattern on Slow stochastic that preceded the recent rally.On longer term weekly chart (not shown), oil's price closed above its three weekly EMAs in long-term bull territory. Weekly technical indicators are looking bullish and showing upward momentum.Brent Crude Oil chartThe daily bar chart pattern of Brent Crude Oil received good support from its 20 day EMA and soared to a 52 week high of 85.45 on Oct 1, before closing .. In a holiday-shortened trading week, FIIs were net sellers of equity on Mon., Tue., and Wed. (Sep 10-12), but net buyers on Fri. Sep 14. Their total net selling was worth Rs 22.9 Billion. DIIs were net sellers of equity on Mon. but net buyers on Tue., Wed. and Fri. Their total net buying was worth Rs 11.2 Billion, as per provisional figures.India's CPI inflation dropped to a 10 months low of 3.69% in Aug '18 against 4.17% in Jul '18 - thanks to lower food prices. WPI inflation eased to 4.53% in Aug '18 from 5.09% in Jul '18. The IIP number was a healthy 6.6% in Jul '18 - lower than the downwardly revised 6.8% in Jun '18 - on the back of good performance by the manufacturing sector and higher offtake of capital goods and consumer durables.India's exports grew by 19.2% to US $27.8 Billion in Aug '18. Imports grew 25.4% to US $45.2 Billion, leaving a trade deficit of US $17.4 Billion. In Jul '18, trade deficit had soared to a five years hi..
Gold chart patternOversold technical indicators triggered a pullback rally on the daily bar chart pattern of Gold. After crossing above its 20 day EMA and 'Support/Resistance zone 3 (1200-1210)', gold's price touched a high of 1217 on Aug 28 but formed a 'reversal day' bar (higher high, lower close).That seems to have brought the pullback rally to an end. Gold's price dropped below its 20 day EMA and closed inside 'Support/Resistance zone 3'. (After a dip below 94.50 on Aug 28, the US Dollar index has moved up above 95 - cooling bullish fervour.) Daily technical indicators are turning bearish. MACD is above its signal line in bearish zone, but its upward momentum has stalled. RSI has moved down after facing resistance from its 50% level. Slow stochastic has turned down after facing resistance from the edge of its overbought zone.Gold's price is trading below its three EMAs in a bear market that was technically confirmed by the 'death cross' of the 50 day EMA below the 200 day EMA ..
WTI Crude Oil chartThe daily bar chart pattern of WTI Crude Oil has been in a down trend since touching a high of 75.30 on Jul 3. Within the down trend, oil's price consolidated sideways within a 'symmetrical triangle' pattern.An expected downward breakout from the 'triangle' on Aug 8 was followed by a pullback to the lower edge of the 'triangle'. Bears may use the pullback to sell.Oil's price is trading above its 200 day EMA in a bull market. However, the 20 day EMA has crossed below the 50 day EMA - which is a bearish signal in the near term. Daily technical indicators are in bearish zones. MACD is falling below its signal line. RSI is sliding down below its 50% level. Slow stochastic has bounced up a bit after getting support from the edge of its oversold zone.Bullish factors like potential supply disruptions due to US sanctions on Iran oil and drop in output from Venezuela are being countered by bearish factors like a strong US Dollar and a ramp-up in production by OPEC.On lon..
S&P 500 index chart patternIt took almost 6 months but bulls finally managed to fill the downward 'gap' formed on Jan 30 on the daily bar chart pattern of S&P 500. By touching an intra-day high of 2848 and closing 2 points lower on Jul 25, the 'gap' between 2838 and 2851 (refer last week's post) was almost completely filled.Bears expectedly put up a fight to defend the 'gap'. The index dropped and closed below the 'gap' on Jul 26. That was a trigger for bears to go on the offensive. On Fri. Jul 27, the index dropped sharply below 2820 before recovering to close at 2819.Daily technical indicators are showing downward momentum in bullish zones. 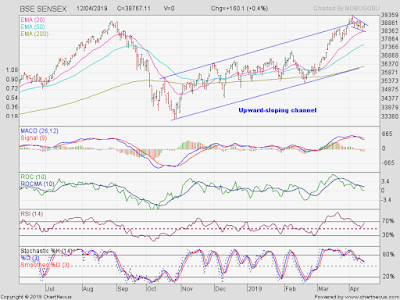 MACD has started to fall towards its rising signal line. RSI is falling after facing resistance from the edge of its overbought zone. Slow stochastic has dropped sharply from its overbought zone.The index is trading above its three EMAs in a bull market. 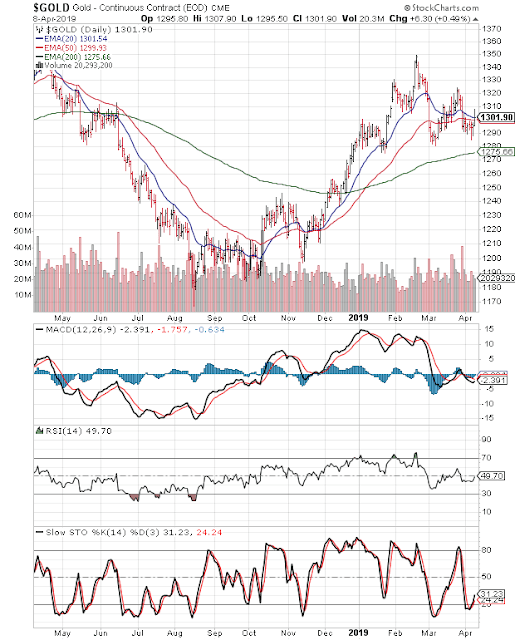 However, some more correction or consolidation is likely before the index can move up ..
Gold chart patternThe daily bar chart pattern of Gold faced strong resistance from its falling 20 day EMA after a short pullback rally, and resumed its correction from the Apr '18 top of 1370. 'Support/Resistance zone 2' (between 1237 & 1248) provided only a few days' support before gold's price plunged down to touch an intra-day low of 1212 on Jul 19th. A brief technical bounce faced resistance from 1237 level and closed lower.Daily technical indicators are looking bearish and oversold. RSI and Slow stochastic showed positive divergences by touching higher bottoms while gold's price dropped lower. The subsequent technical bounce was weak.Gold's price is trading below its three falling EMAs in a bear market.On longer term weekly chart (not shown), gold’s price closed well below its three weekly EMAs in long-term bear territory. Weekly technical indicators are looking bearish and oversold. 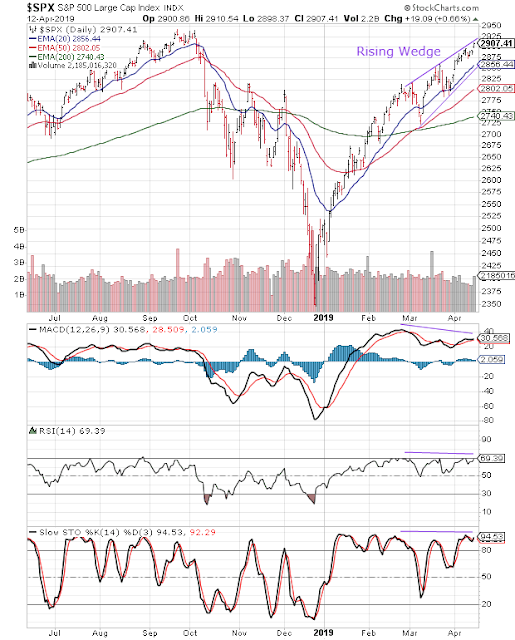 The 50 week EMA has formed a bearish 'rounding top' pattern and is falling towa..
S&P 500 index chart patternFor more than 5 months, the daily bar chart pattern of S&P 500 has been consolidating sideways within a large 'symmetrical triangle' pattern. The rising 200 day EMA indicates that the long-term bull market is very much alive.From Apr '18 onwards, the index has formed a bullish pattern of higher tops and higher bottoms inside the 'triangle'. (At the time of writing this post, the index is testing resistance from the upper edge of the 'triangle'. )In a holiday-shortened trading week, the index touched an intra-day low (below its 20 day and 50 day EMAs) of 2699 on Mon. Jul 2, but rallied to touch an intra-day high (above its 20 day and 50 day EMAs) of 2764 on Fri. Jul 6. Volumes were on the lower side.Daily technical indicators have turned bullish. MACD has emerged from bearish zone, and is about to cross above its falling signal line. RSI has moved above its 50% level. Slow stochastic has risen sharply from its oversold zone.A convincing b..
WTI Crude Oil chartThe daily bar chart pattern of WTI Crude Oil shows a strong fightback by bulls just when bears were gaining the upper hand. After falling below 64 on Jun 18. oil's price gained more than 10 points (16.6%) by closing above 74 on Jun 29.What happened? Wasn't increase in production by the OPEC cartel supposed to put a lid on oil's price? Firstly, the increase of 1 Million barrels/day was less than market expectations. Secondly, Trump's sanctions on Iran's oil exports raised the spectre of supply constraints.Lastly, uncertainty over supply outages in Libya due to an armed struggle and falling North American inventories combined to create a perfect speculative environment for bulls.The speculative nature of oil's price rise last week is visible on the sliding volume bars and the sharp price rise above the three daily EMAs. Such sudden price spikes are unsustainable.Daily technical indicators are looking overbought. MACD is showing upward momentum but negative divergence b..
FIIs were net sellers of equity on Tue. Jun 26, but net buyers on Mon. & Wed. (Jun 25 & 27). Their total net selling was worth Rs 2.72 Billion. DIIs were net buyers on Tue. & Wed. but net sellers on Mon. Their total net buying was worth Rs 2.36 Billion, as per provisional figures.The GST investigation wing has detected tax evasion of over Rs 20 Billion in 2 months through raising of fake invoices to claim input tax credit and GST refunds. Of the 11.1 million registered businesses, less than 100,000 are paying 80% of the taxes.Ahead of next week's first India-US 2+2 dialogue when India's External Affairs Minister and Defence Minister will meet US Secretary of State and Secretary of Defence, President Trump accused India of charging high import duties of 100% on American products. The trade war is well and truly on.Note the following comments from last week's technical update on the daily bar chart pattern of Nifty: "A convincing move above the d..
FIIs were net sellers of equity worth Rs 47.4 Billion during the week, though they were net buyers on Thu. Jun 21. DIIs were net buyers of equity worth Rs 47.2 Billion, as per provisional figures. Sensex and Nifty gained marginally on a weekly closing basis.Out of 21 PSU banks, only 2 - Indian Bank and Vijaya Bank - were able to pay dividends worth Rs 4.44 Billion to the government. This was the worst dividend payout by PSU banks in the past 10 years.The government is considering a proposal to sell a significant proportion of its stake in IDBI Bank to LIC, and has approached IRDAI for clearance (as LIC already holds more than 10% stake in IDBI and can't hold more than 15% in a single company).BSE Sensex index chart patternThe following comments were made in last week's post on the daily bar chart pattern of Sensex: "The 20 day EMA is merging with the lower edge of the 'rising wedge'. That ought to help bulls put up a fight to prevent a likely fall below the 'wedge'. "The ..
S&P 500 index chart patternThe following comments appeared in last week's post on the daily bar chart pattern of S&P 500: "Note that Friday's higher close was on weaker volumes. Bears may use the opportunity to force bulls to retreat. Any further rally is likely to face resistance from the 2810 level. "The index faced resistance at 2790, and pulled back to the top of the 'Flag' pattern on Wed. Jun 13. 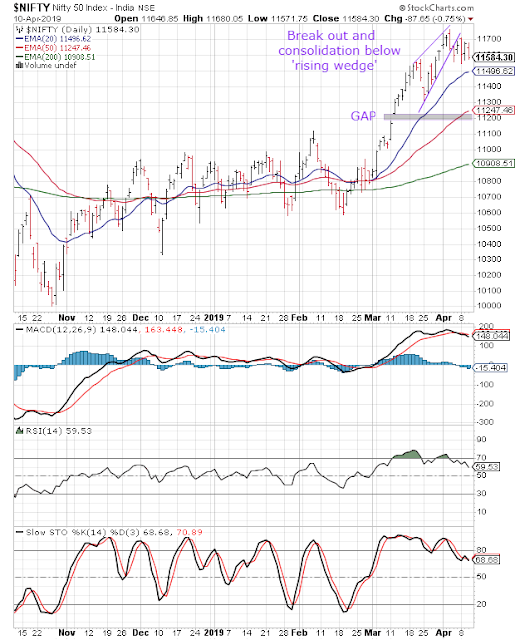 Instead of bouncing up, the index dropped inside the 'Flag' intra-day on Fri. Jun 15 but managed to close just above the 'Flag'.Friday's trading formed a 'hammer' candlestick pattern that has bullish implications. The significant volume spike is probably a sign of 'selling climax'. Daily technical indicators are in bullish zones. MACD and RSI are moving sideways. Slow stochastic is sliding down inside its overbought zone. The index is trading above its three rising EMAs in a bull market. A possible move above 2810 can lead to a test of resistance from 'GAP 1'. Bears can b..
FIIs were net buyers of equity on Mon. Jun 4 but net sellers during the next two trading days this week. Their total net buying was worth Rs 21.1 Billion. DIIs were net sellers of equity on Mon. Jun 4 but net buyers during the next two trading days. Their total net buying was worth Rs 4.7 Billion, as per provisional figures.Rising rural demand and government's infrastructure push propped up sales of 2-wheelers and CVs in May '18. Tata Motors, Ashok Leyland, Bajaj Auto, Royal Enfield, Hero Moto, Maruti, Escorts, M&M showed double-digit sales growth.RBI announced 25 bps (0.25%) increase in repo and reverse repo rates after a 3-day policy meeting today. Increase in interest rates occurred after 4.5 years. The stock market had anticipated the news, and rose on short covering and some value buying.The daily bar chart pattern of Nifty is continuing to struggle in its efforts to cross above the downward 'gap' formed back in Feb 5.On three consecutive trading days - May 31, Jun 1, Jun..
For the month of May '18, FIIs were net sellers of equity worth Rs 117.3 Billion. DIIs were net buyers of equity worth Rs 152.3 Billion, as per provisional figures.Sensex barely gained 0.5% on a monthly closing basis, while Nifty closed flat (losing 3 points despite heavy buying by DIIs).India's GDP growth rate was 7.7% for the Jan-Mar '18 quarter - the fastest growth rate in 7 quarters. For FY 2017-18, GDP growth rate was 6.7%. Nikkei India's Manufacturing PMI eased to 51.2 in May '18 from 51.6 in Apr '18. For the 10th straight month, PMI stayed above 50 (which indicates expansion).BSE Sensex index chart patternThe daily bar chart pattern of Sensex is continuing to struggle near the 132 points downward 'gap' formed almost 4 months back (on Feb 5).The index fell and closed inside the 'gap' on Tue. May 29. It fell further on May 30 - below its 20 day EMA and the 'gap' intra-day - but managed to close inside the 'gap'.On Thu. May 31, the index bou..
FIIs were net sellers of equity on all five trading days. Their total net selling during the week was worth Rs 39.3 Billion. DIIs were net buyers of equity on all five trading days. Their net buying was worth Rs 58.5 Billion, as per provisional figures.Despite heavy buying by DIIs, Sensex gained only 77 points (0.22%) on a weekly closing basis. Nifty closed almost flat - gaining just 9 points over the previous week.India's GDP growth rate will accelerate to 7.5% in FY 2018-19 against 6.6% in FY 2017-18 on better performance from industrial and agricultural sectors, as per a CARE report. Inflation, lending rates, fiscal and current account deficits, exchange rates remain concerns.BSE Sensex index chart patternThe following comments were made in last week's post on the daily bar chart pattern of Sensex: "The index touched an intra-day low of 34822 on Fri. May 18, falling below its previous (May 4) low of 34848 which can lead to further downside. However, by closing exactly at 34848,..
S&P 500 index chart patternThe following comments appeared in last week's post on the daily bar chart pattern of S&P 500: "The bulls still have a lot of work left, as 'GAP 2' is likely to provide resistance. The index appears to be consolidating within a bearish 'Flag' pattern whose upper edge can also provide resistance. "The index touched an intra-day high of 2742 on Mon. May 14 - only to face twin resistances from 'GAP 2' and the upper edge of the bearish 'Flag' pattern. As expected, the index pulled back to the down trend line (refer last week's post).The rest of the week was spent in sideways consolidation within the 'Flag' but above the three EMAs in bull territory. Volumes were stronger on the three down days last week. Bears may force the index to retreat towards its 200 day EMA.Daily technical indicators are in bullish zones, but not showing any upward momentum. Bulls are struggling to retain control of the chart, whose long-term structure ..
FIIs were net sellers of equity worth Rs 14.4 Billion during the three days of trading this week. DIIs were net buyers of equity worth Rs 26.2 Billion, as per provisional figures.After first filling and then falling below the downward 'gap' and the up trend line last week, Nifty pulled back to close above the 'gap' today.Walmart has acquired 77% stake in Flipkart for US $16 Billion, making it the largest eCommerce acquisition in the world. This can be a game-changer for Indian retail industry if Walmart replicate their African strategy of incentivising farmers to produce better quality vegetables and fruit, and then selling those products online.The following remarks made in last week's update on the daily bar chart pattern of Nifty are worth noting: "The up trend line - typical of a counter-trend rally - is a bit too steep and unlikely to sustain much longer...Some consolidation or correction is possible, but a deep correction appears unlikely. "On Fri. Mar 4, the (.. In a holiday-shortened week, FIIs were net sellers of equity on all four trading days. Their total net selling during the week was worth Rs 26.9 Billion. DIIs were net buyers of equity on three of the four trading days. Their net buying was worth Rs 9.3 Billion, as per provisional figures.Both Sensex and Nifty have formed reversal patterns after 5 weeks long counter-trend rallies, and appear ready to resume their downward corrective moves.Nikkei India's Services PMI improved to 51.4 in Apr '18 against 50.3 in Mar '18 (a figure >50 means expansion). The Composite (Manufacturing + Services) PMI rose to a 3-month high of 51.9 in Apr '18 from 50.8 in Mar '18.BSE Sensex index chart patternNote the following comments from last week's post on the daily bar chart pattern of Sensex: "...filling a 'gap' is usually followed by a resumption of the previous move. In this case, the move before the 'gap' got formed was downward...a retreat from the 'gap' zone and some consolidation ..
S&P 500 index chart patternThe daily bar chart pattern of S&P 500 had broken out below the 'rising wedge' pattern intra-day on Fri. Apr 20, but managed to close exactly at the lower edge of the 'wedge'. On Mon. Apr 23, the index attempted a pullback that faced twin resistances from the lower edge of the 'wedge' and the 50 day EMA. The index slipped down to close below the 'rising wedge' at Friday's closing level of 2670.That was a signal for bears to attack. The index dropped sharply towards its 200 day EMA intra-day on Tue. Apr 24, before recovering to close at 2635. On Wed. Apr 25, the index dropped lower intra-day - testing support from its 200 day EMA - and bounced up to close slightly higher at 2639.The 'reversal day' bar (lower low, higher close) triggered a brief rally that faced strong resistance from the 50 day EMA. The index ended absolutely flat on a weekly closing basis.Daily technical indicators are looking neutral to bearish, and are not showing an..
WTI Crude Oil chartAfter faltering slightly on its third attempt, the daily bar chart pattern of WTI Crude Oil finally managed to breach the 'resistance zone' between 66 & 67 with good volume support on Wed. Apr 18.Oil's price touched a 3 yr high of 69.56 on Thu. Apr 19, but formed a 'reversal day' bar (higher high, lower close) that triggered a pullback to the top of the 'resistance zone' on Mon. Apr 23.Oil's price formed another 'reversal day' bar (lower low, higher close), which is pointing to further upside, and closed well above its three rising EMAs in a bull market.Daily technical indicators are looking bullish and a bit overbought. MACD is rising above its signal line inside its overbought zone. RSI is moving sideways just below its overbought zone. Slow stochastic is moving sideways inside its overbought zone.Some consolidation can be expected around current prices before oil's price can move higher.On longer term weekly chart (not shown), oil's price closed above its thre..
FIIs were net sellers of equity on all three days of trading this week. Their total net selling was worth Rs 21.7 Billion. DIIs were net buyers of equity on Tue. & Wed. (Apr 17 & 18) but net sellers on Mon. Apr 16. Their total net buying was worth Rs 15.6 Billion, as per provisional figures.For the 13th trading day in a row, Nifty touched a higher intra-day high (of 10594 today) as it continued its counter-trend rally from its Mar 23 low of 9952, but failed to close above the Fibonacci resistance zone (between 10400 & 10550 - refer last week's post).The International Monetary Fund (IMF) has projected India's GDP growth rate at 7.4% in FY 18-19 and 7.8% in FY 19-20 against 6.7% in FY 17-18 - making it the world's fastest growing major economy.After 9 consecutive days of gains, the daily bar chart pattern of Nifty formed a 'reversal day' bar (higher high, lower close) today, and closed lower within the Fibonacci resistance zone. A 'reversal day' bar often forms at a..
FIIs were net sellers of equity on three out of the five trading days. Their total net selling during the week was worth Rs 16.5 Billion. DIIs were net buyers of equity on four out of the five trading days. Their net buying was worth Rs 8.2 Billion.Sensex and Nifty are in the midst of counter-trend rallies that are retracing the entire falls from their Jan '18 tops to their Mar '18 lows. Sensex gained 1.7% and Nifty gained 1.4% on a weekly closing basis.India's trade deficit widened to US $156.8 Billion in FY 17-18 against $108.5 Billion in FY 16-17. Exports grew 9.8% to $302.8 Billion, but imports grew 19.6% to $459.7 Billion. BSE Sensex index chart patternThe following remarks were made in last week's post on the daily bar chart pattern of Sensex: "Sensex is trying to retrace the 3960 points fall from the Jan 29 top of 36444 to the Mar 23 low of 32484. Fibonacci retracement levels of 38.2% and 50% means near-term upward index targets of about 34000 to 34450. "The dotted box..
S&P 500 index chart patternThe following comment was made in last week's post on the daily bar chart pattern of S&P 500: "Expect the falling 20 day and 50 day EMAs to provide resistance if the index tries to rally. "After falling and closing below its 200 day EMA for the second time in 6 trading sessions on Mon. Apr 2, the index attempted a rally during the next three days and moved above 2670 intra-day on Thu. Apr 5.Resistance from the falling 20 day EMA prevented the rally from progressing further. More trade sanctions against China announced by Trump was just the excuse bears needed to sell.On Fri. Apr 6, the index fell sharply below its 200 day EMA intra-day, but bounced up to close just above it - losing about 1.4% on a weekly closing basis.Daily technical indicators have corrected oversold conditions, but remain in bearish zones and are not showing any upward momentum. Bulls are desperately trying to defend the 200 day EMA. The volume bars show that their resolv..
Gold chart patternSince the second week of Jan '18, the daily bar chart pattern of Gold has been consolidating sideways within a broad 60 points rectangular range (between 1305 and 1365).Note that the entire consolidation has occurred above the rising 200 day EMA in a bull market, with gold's price receiving support from the zone between 1300 & 1310, and facing resistance from the zone between 1360 & 1370.Rectangular consolidation patterns are often continuation patterns. Since gold's price entered the consolidation zone after a rally from its Dec '17 low, the probability of an upward breakout above the resistance zone (between 1360 & 1370) is greater.However, it may be better for longer-term investors to wait for the eventual breakout to initiate any buy/sell action because a 'rectangle' is a fickle pattern that can also act as a 'reversal pattern'.Daily technical indicators are in bullish zones, and showing slight upward momentum. Another test of resistance from the zone ..
WTI Crude Oil chartThe daily bar chart pattern of WTI Crude Oil found support at the 60 level and rallied past its 20 day and 50 day EMAs. On Tue. Mar 20, oil's price breached the down trend line (refer previous post) with good volume support.The rally continued but faced resistance from the lower edge of the 'resistance zone' (between 66 & 67) on Fri. Mar 23. On Mon. Mar 26, oil's price touched an intra-day high of 66.55 but closed lower - forming a 'reversal day' bar that often marks an intermediate top.Daily technical indicators are in bullish zones. MACD is rising above its signal line. RSI is moving sideways. Slow stochastic is turning down inside its overbought zone, and can trigger a dip towards its rising 20 day EMA.The number of active US oil rigs rose to a 3 yr high of 804 last week, which can keep a lid on rising oil prices.On longer term weekly chart (not shown), oil's price closed above its three weekly EMAs in long-term bull territory, but maybe forming a 'double..
FIIs were net buyers of equity during all three trading days this week. Their net buying was worth Rs 7.3 Billion, as per provisional figures.DIIs were net sellers of equity on Mon. Mar 19, but net buyers on Tue. & Wed. (Mar 20 & 21). Their total net buying was worth Rs 7.4 Billion.The effect of several recent IPOs opening one after another is beginning to take its toll on liquidity. The HAL IPO scraped through because LIC picked up almost 70% of the stake on offer. The following was the concluding remark in last week's update on the daily bar chart pattern of Nifty: "The index may revisit and possibly breach last week's low of 10142. "Thanks partly to selling by DIIs on Mon. Mar 19, the index dropped to touch an intra-day low of 10075 and closed just below its 200 day EMA.On Tue. Mar 20, Nifty formed a 'reversal day' bar by opening the day's trading below the channel but closing just above the 200 day EMA. The index rose further today on the back of combined FII and DII bu..
FIIs and DIIs were net buyers of equity during the first three days of trading this week. FII net buying was worth a whopping Rs 71.4 Billion. DII net buying was worth Rs 7.2 Billion, as per provisional figures.FIIs were net buyers on Mon. Mar 12 & Tue. Mar 13 but net sellers today. DIIs were net sellers on Mon. & today but net buyers on Tue. TCS share divestment may have caused Tuesday's large buying by FIIs and DIIs.There was some good news on the macroeconomic front. IIP grew 7.5% in Jan '18 against 7.1% in Dec '17. Cumulative IIP growth during Apr '17 to Jan '18 was 4.1%.CPI inflation eased to 4.4% in Feb '18 from 5.07% in Jan '18 on lower food prices. WPI inflation dropped to a 7 months low of 2.48% in Feb '18 from 2.84% in Jan '18. Oversold technical indicators had hinted at a technical bounce in last week's update on the daily bar chart pattern of Nifty. Thanks to FII buying, the technical bounce on Thu. & Fri. (Mar 8 & 9) turned into a bit of a rally ..
During the week, FIIs were net sellers of equity worth Rs 2.8 Billion as per provisional figures. However, they were net buyers of equity on Tue. Mar 6 and Fri. Mar 9.DIIs were net buyers of equity worth Rs 1.3 Billion for the week, but they were net sellers of equity on Mon. Mar 5, Tue. and Fri. Sensex and Nifty lost about 2.2% each on a weekly closing basis.Loan disbursals to India Inc. are taking a hit at this crucial time of fiscal year end as banks have turned defensive in the aftermath of the Punjab National Bank fraud.BSE Sensex index chart patternThe following comment was made in last week's post on the daily bar chart pattern of Sensex: "Since the 'triangle' has formed after a correction from the Jan 29 top, the likelihood of a downward breakout is higher. "After receiving support from the lower edge of the 'triangle' on Mon. Mar 5, the index broke out below it the next day and touched an intra-day low of 32991 on Wed. Mar 7 - correcting 9.5% from the Jan 29 lifetime high of 36..
S&P 500 index chart patternThe daily bar chart pattern of S&P 500 rose to touch a lower top of 2789 on Tue. Feb 27 and closed below the 2750 level - forming a 'reversal day' bar (higher high, lower close) that often marks an intermediate top.Bears took the opportunity to do some serious selling. The index dropped below its 20 day and 50 day EMAs to an intra-day low of 2660 on Thu. Mar 1 before closing above 2675.On Fri. Mar 2, the index dropped lower to 2647 but closed higher at 2691 - forming another 'reversal day' bar (lower low, higher close) which may bring only a temporary respite for bulls.Daily technical indicators are looking bearish. MACD has moved down to merge with its signal line in bearish zone. RSI has moved below its 50% level. Slow stochastic has fallen sharply from its overbought zone and is showing downward momentum.Trump's threat of a trade war by introducing import tariffs on steel and aluminium has provided fresh impetus to bears. Expect some more correctio..
WTI Crude Oil chartA pullback towards the 50 day EMA was expected in the previous post on the daily bar chart pattern of WTI Crude Oil due to oversold technical indicators and formation of an 'inverted hammer' candlestick.Oil's price formed a small 'double bottom' reversal pattern at 58 that turned the expected pullback into a rally. Oil's price rose above its 50 day and 20 day EMAs to the 64 level in bull territory.Daily technical indicators have turned bullish. MACD has crossed above its signal line and entered bullish zone. RSI has crossed above its 50% level. Slow stochastic is rising towards its overbought zone.A convincing move above the (purple) down trend line is required if bulls wish to regain control of the chart. However, in a recent forbes.com article, Art Berman has given logical explanations why oil prices are at a crossroads and can settle in the 55-65 range.On longer term weekly chart (not shown), oil's price closed above its three weekly EMAs in long-te..
FIIs were net sellers of equity worth Rs 29.6 Billion during the first three trading days this week. DIIs were net buyers of equity worth Rs 34 Billion, as per provisional figures.The 33 points downward 'gap' formed on Feb 5 is looming like a dark cloud over bullish hopes of a quick index recovery - threatening more rain (i.e. selling).India's trade deficit widened to a 56 months high of US $16.3 Billion in Jan '18 compared to $14.9 Billion in Dec '17 and $9.91 Billion in Jan '17. The deficit increased to $131.14 Billion during Apr '17-Jan '18 period against $114.9 Billion during Apr '16-Jan '17.The daily bar chart pattern of Nifty has been consolidating sideways after falling below its 50 day EMA to an intra-day low of 10276 on Feb 6. The sliding 50 day EMA has provided strong overhead resistance since then.The Feb 6 panic low was tested on Feb 19 without getting breached. The index bounced up a bit today on short-covering. The index continues to trade above its rising 200 day EMA, so.. In a holiday-curtailed trading week, FIIs were net sellers of equity worth Rs 28.5 Billion, as per provisional figures. DIIs were net buyers of equity worth Rs 23.7 Billion.For the second week in a row, Sensex and Nifty traded below the downward 'gaps' formed on Feb 5, but didn't lose much ground on a weekly closing basis.India's wholesale inflation rose slower than expected in Jan '18. WPI eased to 2.84% YoY compared to 3.58% in Dec '17 due to lower food prices.BSE Sensex index chart patternThe daily bar chart pattern of Sensex consolidated sideways during the week. The failure to close above the 50 day EMA despite intra-day breaches three days in a row was a sign that bears are continuing to 'sell on rise'.The fact that Sensex didn't fall inside the 'support/resistance zone' between 32550 and 33800 may provide some solace to bulls, but not for long.Market sentiment shifted from extremely bullish to bearish due to re-introduction of LTCG tax. FIIs have voted with their feet. The PNB s..
S&P 500 index chart patternNote the following remark from last week's post on the daily bar chart pattern of S&P 500: "...formation of two downward 'gaps' and strong volumes on down-days should be of real concern for bulls. "On Mon. Feb 5, the index fell sharply below its 50 day EMA to an intra-day low of 2638, and then bounced up a bit to close just below the expected support zone between 2650 & 2700. Next day's pullback on short-covering and value buying took the index to the upper edge of the support zone. On Wed. Feb 7, the index touched an intra-day high of 2728 but formed a 'reversal day' bar (higher high, lower close) and closed within the support zone.The index closed 100 points lower on Thu. Feb 8 after another strong bear attack. On Fri. Feb 9, the index opened trading with an upward gap, only to drop below its 200 day EMA intra-day - for the first time since Nov '16.The index recovered to close above 2600, forming another 'reversal day' bar (lower low, higher..
FIIs have turned bears during the first three days of trading this week. Their net selling in equities crossed a huge Rs 46.1 Billion, as per provisional figures. DIIs were net buyers of equity worth Rs 33.2 Billion.All gains made by Nifty since mid-Dec '17 got wiped out in the first 4 trading sessions in Feb '18. Such can be the severity of bull market corrections.As was expected by market analysts, RBI Governor maintained interest rate status quo in the bi-monthly policy meeting today. Bears 'sold on news'. The daily bar chart pattern of Nifty had started correcting after touching a lifetime high of 11172 on Jan 29. Overbought technical indicators and rumours of re-introduction of long-term Capital Gains tax (LTCG) in the budget led to nervousness and profit-booking.The rumours turned out to be true when FM announced a 10% LTCG on gains effective Apr 1 '18 on budget day (Feb 1). Strong selling followed by a sharp recovery caused only an 11 points drop.Worse was to come on Fri. F..
During Jan '18, FIIs were net buyers of equity worth Rs 95.7 Billion as per provisional figures - after five straight months of net selling. DIIs were also net buyers of equity (as they have been since Apr '17), but worth only Rs 4 Billion.FIIs were net buyers of equity worth Rs 20.5 billion during the first two trading days of Feb '18. DIIs were net sellers of equity worth Rs 8.7 Billion, as per provisional figures.Reintroduction of long term Capital Gains tax on equity shares and a 10% tax on distributed income from equity-oriented mutual funds in the recent budget threw cold water on the bull party in the Indian stock market.BSE Sensex index chart patternThe daily bar chart pattern of Sensex touched new intra-day (36444) and closing (36283) highs on Mon. Jan 29 on the back of net buying in equities by both FIIs and DIIs.Hugely overbought technical indicators, proximity to the budget and rumours of introduction of long-term capital gains tax (LTCG) in some form led to profi.. Volumes were expected to be low due to F&O expiry on Jan 25 and Republic Day holiday on Jan 26. That didn't deter FIIs from buying. Their net buying in equities was worth Rs 45.1 Billion during the week.DIIs were net sellers of equity worth Rs 14.5 Billion, as per provisional figures. Sensex (36268) and Nifty (11110) touched new highs during the week before retreating a bit due to profit booking.GST collection reversed trend by rising to Rs 867 Billion in Dec '17. Collections had slipped to Rs 808 Billion in Nov '17 from more than Rs 830 Billion in Oct '17. Measures to raise compliance are beginning to show results, as per government officials.BSE Sensex index chart patternThe daily bar chart pattern of Sensex touched new intra-day and closing highs on Wed. Jan 24, but formed a 'doji' candlestick pattern (which indicates indecision among bulls and bears).There was profit booking on Thu. Jan 25 before the long weekend. Bulls had built up a good head of steam after breaking out ..
FIIs have turned bulls again. (This post may explain why.) Their net buying in equities was worth Rs 42.3 Billion, as per provisional figures. DIIs were net sellers of equity worth Rs 7 Billion during the week, but were net buyers on Fri. Jan 19.Sensex (35511) and Nifty (10895) closed the week at lifetime highs. Nifty crossed the 10900 level intra-week for the first time ever.India's forex reserves rose by US $2.7 Billion to touch a lifetime high of $413.8 Billion in the week ending on Jan 12 '18.BSE Sensex index chart patternThe daily bar chart pattern of Sensex rose to touch new intra-day and closing highs on the back of strong buying by FIIs. DIIs joined the bull party on Wed. & Fri. (Jan 17 & 19), but were sellers on the other three days.All three EMAs are rising, and the index is trading above them in a bull market. Sensex closed more than 3500 points above its 200 day EMA, and is looking quite overbought.All four daily technical indicators are well inside their respective..